To navigate Light-fire.net, use the links at the top of the page. To find different comics, use the "First, Previous, Most Recent, Next" links at the top of the webcomics. What is this "Go to Top" thing? I've added Go to Top links to some pages so that you can easily navigate back to the top of the page when you are done reading it, and use the menu at the top to get to the next page. Every little bit helps! Just don't click them by accident or you might lose your spot. Also, they may not work properly in all browsers. How am I supposed to read the comics? 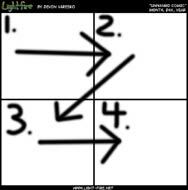 Most of my comics so far are four frames each, read them as the following helpful picture illustrates! An extra tip here - I usually try to add the text with the bubbles moving from top left to bottom right, so when you are reading them, if you want to read the text in order, it would be a good idea to follow in that general direction (as opposed to reading right to left or bottom to top). As an aside, in Japan manga are generally ordered from right to left. So far, I don't intend to emulate that method of organization.